Dan Thompson is the Vice President of Mall & Outlet Leasing for The Woodmont Company’s portfolio, including third-party assets. 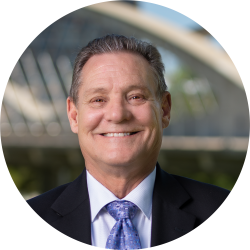 Dan’s career in the real estate industry began when he was the principal of his own appraisal and consulting firm 30+ years ago. In 1991, Dan became the Senior Leasing Representative for Simon Property Group where he worked on more than 25 malls in Florida and other southeastern states. Dan transitioned into the outlet arena with The Mills Corporation and was involved in the ground up leasing of 7 Mills properties. He was also the Director of Mall Leasing with Aronov Properties at this time. In 2001, Dan joined CBL & Associates where he became a Regional Director of Mall Leasing. He was responsible for more than 16 regional malls and managed a leasing team of 8-9 mall leasing professionals. Dan has worked on more than 60 enclosed regional malls throughout his tenure and continues to focus on “value add” opportunities. In 2007, he left CBL to become the Senior Leasing Representative for Poag & McEwen Lifestyle Centers where he grew his experience in open-air lifestyle centers in Memphis, Tennessee. At this position, he worked on ground-up developments in addition to existing properties for institutional owners and local ownership. Dan has completed more than 600 leases with national, regional, and local tenants.